Address: 8709 E. Caribsea St. Direct Beach Access 3 houses away! This traditional Oceanside Beach Cottage is a great home for a Family Vacation. 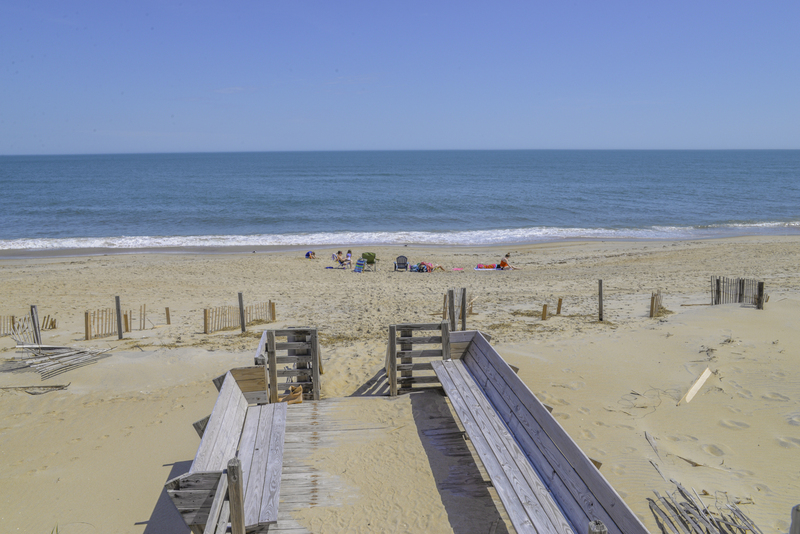 Located in South Nags Head, you are sure to be pleased w/ the quiet location & easy access to the beach (3rd house back from Ocean w/direct access). Nicely decorated & very well equipped, large covered deck w/furniture. Ground Level: Parking for 2 Cars, Steps to Entry, Fish Cleaning Station, & Enclosed Outside Shower. Main Level: Living/Dining/Kitchen Area, Flat Screen TV, VCR, DVD, 3 Bedrooms (1 w/King & TV, 1 w/Queen & TV,& 1 w/Single, Bunk Set, & TV), Full Bath, Half Bath, & Covered Deck w/Hammock Swing, Deck Furniture, Picnic Table, & Ocean Views. Features include: CA/C & Heat, Washer/Dryer, Dishwasher, Microwave, Blender, Phone, 4 Flat Screen TVs, VCR, 2 DVD's, Radio w/CD & Tape Player, Wireless Internet, Baby Equipment (Port-a-Crib & High Chair), & Bike Path. No Pets. This is a Non-Smoking Unit. Loved the house and location! Well stocked kitchen too! My favorite place was the big porch. "Keep current realtor & staff and current cleaning staff !" This guests rate their experience as excellent! Enjoyed our vacation despite the heavy rain we experienced during our stay. House was very comfortable. It's a nicely decorated house and made us feel welcomed,comfortable, and at home. Beautifully decorated, lovely in all respects. Meticulously clean. Had everything we needed, even replacement batteries for TV remote! The nearness to the beach access and reasonable rate make Sun Byrne a wise choice for a small family or group! Wonderful house for our family! Air conditioning was comfortable and the kitchen is well stocked with utensils,dishes, pots/pans, and appliances. We especially enjoyed the two seater hammock and porch furniture. Thank you for providing a great beach getaway.